oil on linen, 28" x 24"
gouache on paper, 30" x 22"
Thirty-five years ago, Susan Osgood picked up a brush and began to make art in earnest. It would be interesting to see what her first impulses were. Were there any clues to the fact that one day she would shed all conventional ideas about picture making and take the brave step to work in a language of pure painting? A graduate of Rhode Island School of Design, this artist worked figuratively for some time before coming round to the exploration, discovery and distillation of a style of painting, which is purely visual, consistent, and somehow universal. That is, the use of paint, and all of its properties as a visual experience. Color, in a large sense, is used to convey content, light, mood, and what must be described simply as "energy." 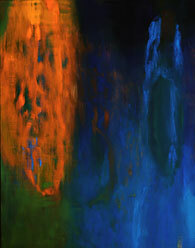 In her newest work, color has become rich and seductive, shimmering and glowing. It is deep, earthy and strong. Gestural brushstrokes, which describe partially defined natural forms add the element of drawing, and support the expressive use of color. Her use of color and expressive application of it, via an exciting vocabulary of intuitive brushwork, seduce the viewer immediately and draw one into a world of pleasurable visual sensation. One needs bring nothing to these paintings but a love of art, as they go straight past your brain and right to your senses. In an artist's statement provided by the gallery, Osgood states: "For me painting and drawing are forms of travel, which give the sense of being in unfamiliar territory and the wonder of discovery. My intent is to make images evocative enough to move the viewer to unknown places." Perhaps it is Susan's own inspiring experience of travel in distant cultures which has made her want to bring that mind-opening experience to others. For travel has been a part of her life for the past twenty years. As a staff artist for the University of Chicago, she has returned annually to Luxor, Egypt for four months of the year to draw the carved and painted reliefs of undocumented Pharaonic temples. She has also been inspired by travels in such exotic places as the Middle East, India, North Africa and Europe, exhibiting her work in Egypt and extensively in Germany. Walking into the intimate space of the Catherine Dianich front room seems much like what the experience of finding an oasis in the desert might be. Suddenly one is surrounded by the colors of life in nature, by the isolated moments in the natural world where light is captured in shafts and beams, and of a living energy, buzzing and humming all around. And this vibrating energy was like a refreshing drink of pure water for the soul. Moments like the ones found by those who wander in the natural world, which transfix and temporarily beguile the senses, are caught forever in Osgood's paintings. Growing up in Westmoreland, just across the border in New Hampshire, Osgood was undoubtedly filled at a young age with such experiences. In our interview, she communicated the idea that though her images are not copied from nature, they are something like what happens in nature. In this sense her work does not quote from the book of nature but adds another chapter to it. And what about her color? She is obviously a knowledgeable colorist with a long-earned familiarity with the interactive properties of pigments available to the oil painter. Another artist might stare in wonder at the way she can put two blues next to each other, supported by contrasting and harmonizing hues, in a way that brings life to the different yet similar tones which must be seen to be appreciated. It is like experiencing colors for the first time. As if, having been blind, one had suddenly gained sight. The color creates soft contrasts and rich harmonies. It is acidy at times and earthy, contemplative or strongly expressive. The freshness is continually surprising and some colors in the mottled, atmospheric grounds don't emerge until one has studied the paintings for some time. This of course happens in nature also, where a myriad of life forms hide by use of pigmentation camouflage. They are there, perhaps watching us, but it takes a while to see them. The effects of gentle yet pungent contrasts make color in the paintings act almost like lights shining out at the viewer. The warm yellows or reds seem not only illuminative, but also heat-bearing, actually conveying temperature. And in using the word cool, referring to deep blues and earthy tones in the grounds, you would not be talking only about the spatial qualities of color, but about coolness one can feel as temperature. Well, these paintings awaken the senses and the specialness we all can feel about life. We are nurtured by their vibe. In a medium-sized painting entitled "Zar IV", a softly mottled ground of warm and cool earth tones ranges from receding grey-greens on the left side of the composition, to varying oranges on the right, which culminate at the top in a single brushstroke of Indian red. 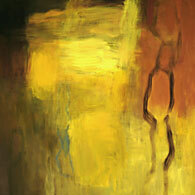 The earthy ground builds an environment for a central event in paint expressed in the color yellow. This mass of hovering gold rises up from the bottom, becoming more intense as it does. The yellow gives the immediate impression of captured light. The mass of tawny brushstrokes creates a hovering form, which visibly buzzes with energy. This glowing shape of presence seems to go in and out of focus, as a result of the different values of yellow ranging through the conglomerate of gestures. To the right, passing vertically up through the image is a partially described chain of oval shapes with slight geometric qualities. This tentative bit of drawing suggests a chain of DNA or some reaching, pod-like plant. It is not a plant itself that one perceives, rather the qualities a plant exhibits, multiplying in like kind and reaching up towards the sun. The chain of forms is brushed on in the color brown. It appears again in smaller case, like an echo, on the left, atmospherically integrated with the ground. Again, on the lower left another nuance of it can be found as a single oval, in the background. Thus the repetition of forms, and similar forms, is experienced, as one would find them in nature. This humming expression in gestured yellow has such presence, the viewer might personify it, were it not for its amorphous qualities. Osgood resists the temptation to compromise her expressive language, which is clearly that of "pure painting." 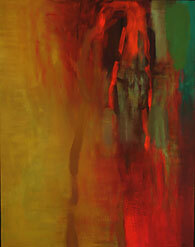 In "Untitled I," she shows that she is not afraid of going all the way with color and uses bright reds to strong effect. Cascading down from the top right, light cadmium splashes at the bottom in a hot lava burst of vermilion. The reds gain significant identity from the surrounding colors in the background, which range from mottled ochre to soft olive green and a shadowy turquoise. This work has significant metaphoric mystery as it suggests something like a distant celestial event, but in paint. Soft, sandy atmospheric brush strokes dapple the ochre, on the left side of the canvas, repeating the character of the falling rouges. This "echoing" of a dominant expression in the drawing can be seen, used again, in two other paintings. That is, a partially described form is drawn and supports the improvised, expressively painted part of the painting, which in turn relies on color and paint application for its character. The drawn form is then repeated in less contrast and perhaps in smaller scale, somewhere in the painting. In "Untitled II" a golden, sunlit left side is integrated with a blue-gray body of space on the right, and both wash down through the canvas like water or light. A small group of bright orange marks glowingly float on the watery blue-grey and are echoed by a light set of similar marks, atmospherically hovering in the area of ochre. In "Zar III," painted mostly in soft, luminous greens, an expressively brushed shape of color mounts up in similar fashion to that in "Zar I." The brushstrokes, alternatingly horizontal, stacking up to vertical strokes, culminate in a large version of the oval-like form previously mentioned. That form is repeated in the ground as a rhyming pumpkin-orange shape, in smaller scale. 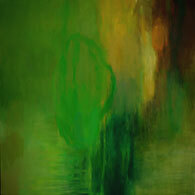 This painting celebrates the effect of light passing through verdant foliage. 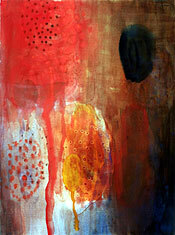 The brushwork recalls the Neo-Expressive style of the painter Susan Rothenburg. Included in the room of oil paintings were four small works, oil on paper, mounted on panels. Bright, floating, small brush strokes of specific hue are carefully found and influenced by the surrounding ground, mottled in varying rhythmic tones. The ground interests the viewer's eyes long enough to bring the attention back repeatedly to the brighter high notes. In "Seif II," it was hard to get over what two strokes of blue did, sitting next to each other. One seemed like ultramarine, while the other was a manganese-cerulean. Touches of light and dark cadmium yellow and a bit of olive visually enrich these blues to the point of wonder. Like great character development in a good film, we can see the difference, in the mutually exclusive, vibrant blues. The paintings in Catherine Dianich's front room were backed up by a series of works on paper in the back hall. This work is identified as the "Saved Messages" series. The papers used for these gouache paintings are discarded photo blueprints documenting the ancient graffiti carved or painted on Egyptian temple walls nearly 3,000 years ago. The messages, written by priests and visitors to the temple, reveal legal records, notes on the height of the Nile and votives, asking that the writer's name remain good in the presence of the temple gods and goddesses. These pieces could be compared to works on paper that Susan Osgood is currently exhibiting at the American Traders store in West Brattleboro (see listing #1 on page 28). The difference in the two sets of drawings (besides the fact that the work at American Traders is from a half-dozen years earlier) is mostly the character of the paper. In both bodies of work, the relationship of drawing to ground is similar to that found in her oil paintings. Working with the water-based gouache, however, Susan is looser and more expressive in both brushwork and ground. A love of the properties of water with paint can be experienced in the puddles, floes, dabs and splashes visible in the earth-brown and blue grounds. In the works on paper, the brushwork in the drawing, exploring similar oval forms to those found in the paintings, connected in chains or alone, is concentrated but more tentative. Intuition and curiosity abound. The works at Catherine Dianich have small Egyptian hieroglyphs on the paper that pop in and out through the drawings, adding a very interesting element to the visual experience and a bit of a conceptual edge. As Susan has been immersed in the contemplation and recording of such artifacts over the last two decades, it seems that the ancient Egyptian pictographic glyphs have reincarnated their essence into her contemporary language of painterly expression. One can also enjoy a rich and beautiful oil painting entitled "Trust in Darkness" at American Traders. Which shows an earlier, similar approach to painting, while being earthier in palette, relying on strong effects of captured light and less on expressive color. If you missed the show at the Dianich Gallery, you've missed something great, but you can still see Susan Osgood's work at American Traders and in a group show at Amy's Bakery Arts Café in October. Scot Borofsky is a writer and painter living in Brattleboro. He is currently working on a grant-funded exhibition to open in November at All Souls Church in West Brattleboro.